April 28, 2017, 1:40 p.m.
As many people have noted, this is the fourth successive year with a major vote within the UK. But alongside two general elections and two big referendums, the past 30 months the Conservatives, Labour, the Liberal Democrats and the SNP have all changed leaders, making this a highly charged time for politics. While historically it is not uncommon for a couple of general elections to be held in a short space of time (1950 and 1951, 1964 and 1966, February and October 1974), it is unusual that we have so many major votes with so many implications taking place within a three year span. As well as rewriting the political direction of the UK, our analysis suggests that these events have also started to reshape the electorate in a way that doesn’t normally happen over such a short space of time. By looking at the voting intention of over 12,000 members of the public, we have segmented the population up into three key groups based on how they cast their ballot at the last election and their current voting intention: Stickers, Switchers, and Undecideds. Approaching six in ten (57%) voters currently plan to vote the same way as they did in 2015. 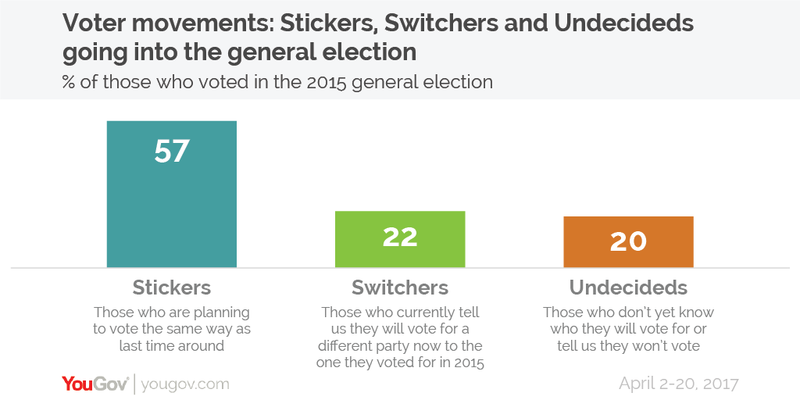 However what is more interesting is the differences between the parties when it comes to Stickers, Switchers and Undecideds. Only around half of people who chose Labour, UKIP, or Liberal Democrats in 2015 plan on sticking with that party this time, with the remainder either having moved party or being undecided at this stage. In sharp contrast, the Conservatives are holding on to the highest proportion of their vote. Over three quarters (77%) of their 2015 voters say they will vote with the party again this time around. Going into the campaign, one in five (22%) plan on switching parties. Such a high level of voter “churn” is unusual, especially given it is not very long since the last general election. However, the EU Referendum seems to have caused a significant realignment within a brief space of time with many voters finding their own views on Brexit are out of step with the views of the party they voted for in 2015. Whether this is a short term change that will last only in this election or a longer-term repositioning of the electorate remains to be seen. 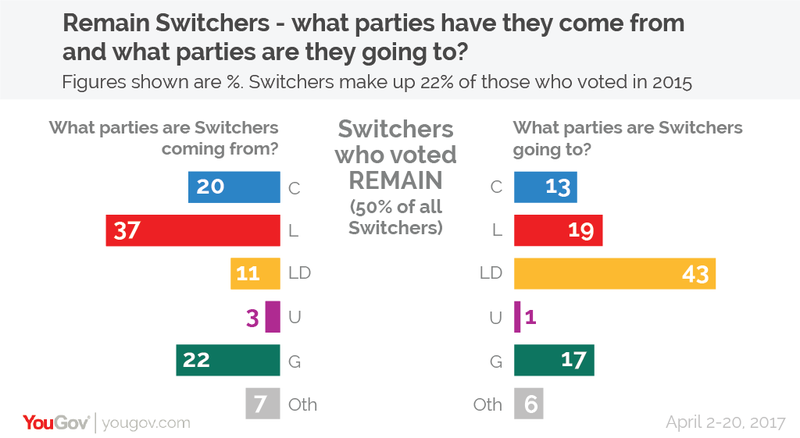 Either way, we can see the impact of last year’s vote by looking at switchers and breaking them down by which way they went in the EU referendum. Of those that voted Leave in the referendum and have since changed their voting preference, 57% have moved to the Conservatives. 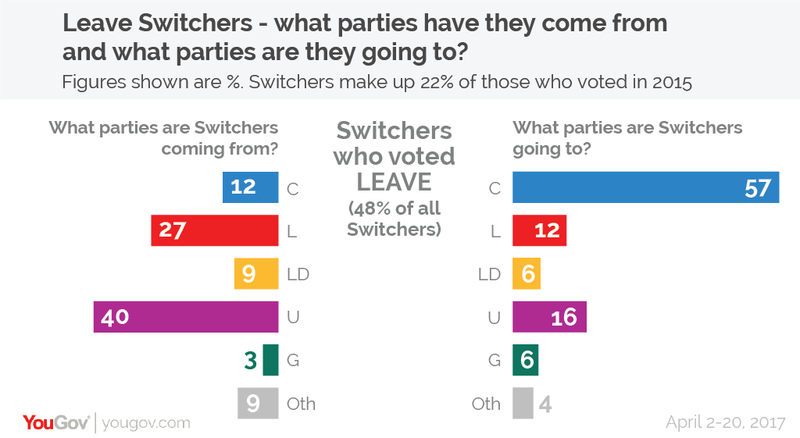 The data shows that Leave switchers are mostly coming from Labour and UKIP. Among those that wanted to remain in the EU last June and have since switched who they plan to vote for, 43% have moved to the Liberal Democrats. These Remain switchers are generally coming from Labour and the Greens, with a smaller number moving from the Conservatives. 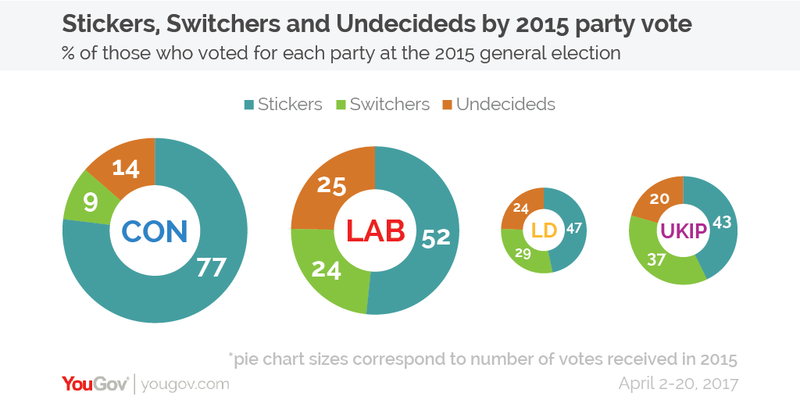 Our analysis suggests there aren’t actually that many direct switchers between Labour and the Conservatives – only around 1% of all voters. To put this in context, this is around half the number of people who have moved from UKIP to the Conservatives. Yet it is worth noting that in Labour/Conservative marginal seats these switchers have double the power of other voters as they represent one less vote for the Labour candidate and one more for the Conservative. So, how has all of this flux influenced the headline voting intention numbers? Labour has seen a dramatic drop in their vote share as they have been losing both Remain and Leave voters to other parties. 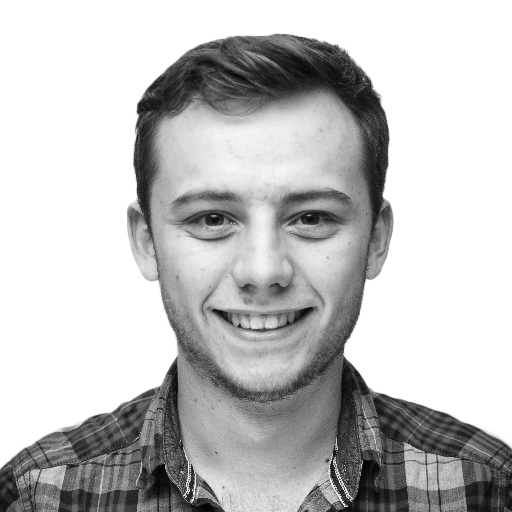 Although the Liberal Democrats have struggled to hold on to many of their 2015 voters (traditionally the Lib Dems have seen more churn in their support than other parties), they have seen a modest increase in their vote share as they have been gaining Remain voters from Labour and the Conservatives. UKIP has seen a drop in their vote share as they have been losing Leave voters to the Conservatives without gaining many votes from anyone else. It is also worth noting that the situation appears to be getting worse, with the party dropping to a low of 5% in our latest poll. Because of the nature of a snap election, there are more undecided voters – those who don’t yet know how of if they will vote this time around – than there might otherwise be this close to Election Day. This is because many people thought they would have a few years to make up their minds about who to support. So great are the numbers of undecideds that more people currently tell us they are don’t know who they will support than say they plan to vote Labour. How and if these voters break over the coming weeks will determine the final result, especially in marginal constituencies. Were they to drift back to the party they voted for last time, this would disproportionately help Labour (as that is where many of them have come from). However if they start to move towards the Conservatives, just like other voters have, we could be heading for an even bigger Tory victory than many currently anticipate.